The Jus-Grab-It! 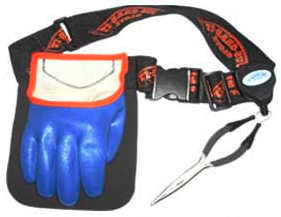 Glove is an excellent way for fishermen to enjoy fishing, without having to search for a towel and/or pliers to hold the fish while extracting the hook from its mouth. The glove is designed for convenience in order to protect your hands from fish slime, minor cuts, and scratches that can often occur while fishing. NOTE: The Jus' Grab It Glove fits like a baseball glove. A left handed person would most likely wear a right glove, and a right handed person would wear a left glove.